Klein was born in Nice, in the Alpes-Maritimes department of France. His parents, Fred Klein and Marie Raymond, were both painters. His father painted in a loose post-impressionist style, while his mother was a leading figure in Art informel, and held regular soirées with other leading practitioners of this Parisian abstract movement. Klein received no formal training in art, but his parents were both painters who exposed him to different styles. His father was a figurative style painter, while his mother had an interest in abstract expressionism. With this famous symbolic gesture of signing the sky, Klein had foreseen, as in a reverie, the thrust of his art from that time onwards—a quest to reach the far side of the infinite. Between 1947 and 1948, Klein conceived his Monotone Symphony (1949, formally Monotone Silence Symphony) that consisted of a single 20-minute sustained chord followed by a 20-minute silence. In early 1948, Klein was exposed to Max Heindel's 1909 text The Rosicrucian Cosmo-Conception and pursued a membership with an American society dedicated to Rosicrucianism. While attending the École Nationale des Langues Orientales Klein began practicing judo. During the years 1948 to 1952, he traveled to Italy, Great Britain, Spain, and Japan. He traveled to Japan in 1953 where he became, at the age of 25, a master at judo receiving the rank of yodan (4th dan/degree black-belt) from the Kodokan, becoming the first European to rise to that rank. Later that year, he became the technical director of the Spanish judo team. In 1954 Klein wrote a book on judo called Les Fondements du judo. The same year, he settled permanently in Paris and began in earnest to establish himself in the art world. Although Klein had painted monochromes as early as 1949, and held the first private exhibition of this work in 1950, his first public showing was the publication of the artist's book Yves Peintures in November 1954. Parodying a traditional catalogue raisonné, the book featured a series of intense monochromes linked to various cities he had lived in during the previous years. Yves Peintures anticipated his first two shows of oil paintings, at the Club des Solitaires, Paris, October 1955 and Yves: Proposition monochromes at Gallery Colette Allendy, February 1956. Public responses to these shows, which displayed orange, yellow, red, pink and blue monochromes, deeply disappointed Klein, as people went from painting to painting, linking them together as a sort of mosaic. From the reactions of the audience, [Klein] realized that...viewers thought his various, uniformly colored canvases amounted to a new kind of bright, abstract interior decoration. Shocked at this misunderstanding, Klein knew a further and decisive step in the direction of monochrome art would have to be taken...From that time onwards he would concentrate on one single, primary color alone: blue. The next exhibition, 'Proposte Monocrome, Epoca Blu' (Proposition Monochrome; Blue Epoch) at the Gallery Apollinaire, Milan, (January 1957), featured 11 identical blue canvases, using ultramarine pigment suspended in a synthetic resin 'Rhodopas', described by Klein as "The Medium". Discovered with the help of Edouard Adam, a Parisian paint dealer, the optical effect retained the brilliance of the pigment which, when suspended in linseed oil, tended to become dull. Klein later deposited a Soleau envelope for this recipe to maintain the "authenticity of the pure idea." This colour, reminiscent of the lapis lazuli used to paint the Madonna's robes in medieval paintings, was to become known as International Klein Blue (IKB). The paintings were attached to poles placed 20 cm away from the walls to increase their spatial ambiguities. Interestingly, all 11 of the canvases were priced differently. The buyers would go through the gallery, observing each canvas and purchase the one that was deemed best in their own eyes specifically. Klein's idea was that each buyer would see something unique in the canvas that they bought that other buyers may not have seen. So while each painting visually looked the same, the impact each had on the buyer was completely unique. The show was a critical and commercial success, traveling to Paris, Düsseldorf and London. The Parisian exhibition, at the Iris Clert Gallery in May 1957, became a seminal happening. To mark the opening, 1001 blue balloons were released and blue postcards were sent out using IKB stamps that Klein had bribed the postal service to accept as legitimate. Concurrently, an exhibition of tubs of blue pigment and fire paintings was held at Galerie Collette Allendy. For his next exhibition at the Iris Clert Gallery (April 1958), Klein chose to show nothing whatsoever, called La spécialisation de la sensibilité à l’état matière première en sensibilité picturale stabilisée, Le Vide (The Specialization of Sensibility in the Raw Material State into Stabilized Pictorial Sensibility, The Void): he removed everything in the gallery space except a large cabinet, painted every surface white, and then staged an elaborate entrance procedure for the opening night: the gallery's window was painted blue, and a blue curtain was hung in the entrance lobby, accompanied by republican guards and blue cocktails. Thanks to an enormous publicity drive, 3,000 people queued up, waiting to be let into an empty room. The art historian Olivier Berggruen situates Klein "as one who strove for total liberation," forming connections between perverse ritual and a disdain of convention. Klein had studied judo in Japan between 1952 and 1954, and also displayed an interest in Zen Buddhism. According to Berggruen, he used ritual as a means not to attain belief, but rather as a forum through which to reach abstraction—transcending worldly vestiges temporarily, and returning to earth as a new being. Recently my work with color has led me, in spite of myself, to search little by little, with some assistance (from the observer, from the translator), for the realization of matter, and I have decided to end the battle. My paintings are now invisible and I would like to show them in a clear and positive manner, in my next Parisian exhibition at Iris Clert's. Later in the year, he was invited to decorate the Gelsenkirchen Opera House, Germany, with a series of vast blue murals, the largest of which were 20 metres by 7 metres. The Opera House was inaugurated in December 1959. Klein celebrated the commission by travelling to Cascia, Italy, to place an ex-voto offering at the Saint Rita Monastery. "May all that emerges from me be beautiful," he prayed. The offering took the form of a small transparent plastic box containing three compartments; one filled with IKB pigment, one filled with pink pigment, and one with gold leaf inside. The container was only rediscovered in 1980. Klein's last two exhibitions at Iris Clert's were Vitesse Pure et Stabilité Monochrome (Sheer Speed and Monochrome Stability), November 1958, a collaboration with Jean Tinguely, of kinetic sculptures, and Bas-Reliefs dans une Forêt d’Éponges (Bas-Reliefs in a Sponge Forest), June 1959, a collection of sponges that Klein had used to paint IKB canvases, mounted on steel rods and set in rocks that he'd found in his parents' garden. Despite the IKB paintings being uniformly coloured, Klein experimented with various methods of applying the paint; firstly different rollers and then later sponges, created a series of varied surfaces. This experimentalism would lead to a number of works Klein made using naked female models covered in blue paint and dragged across or laid upon canvases to make the image, using the models as "living brushes". This type of work he called Anthropometry. Other paintings in this method of production include "recordings" of rain that Klein made by driving around in the rain at 70 miles per hour with a canvas tied to the roof of his car, and canvases with patterns of soot created by scorching the canvas with gas burners. Klein and Arman were continually involved with each other creatively, both as Nouveaux Réalistes and as friends. Both from Nice, the two worked together for many years and Arman even named his son, Yves Arman after Yves Klein who was his god-father. Sometimes the creation of these paintings was turned into a kind of performance art—an event in 1960, for example, had an audience dressed in formal evening wear watching the models go about their task while an instrumental ensemble played Klein's 1949 The Monotone Symphony. In the performance piece, Zone de Sensibilité Picturale Immatérielle (Zones of Immaterial Pictorial Sensibility) 1959–62, he offered empty spaces in the city in exchange for gold. He wanted his buyers to experience The Void by selling them empty space. In his view this experience could only be paid for in the purest material: gold. In exchange, he gave a certificate of ownership to the buyer. As the second part of the piece, performed on the Seine with an Art critic in attendance, if the buyer agreed to set fire to the certificate, Klein would throw half the gold into the river, in order to restore the "natural order" that he had unbalanced by selling the empty space (that was now not "empty" anymore). He used the other half of the gold to create a series of gold-leafed works, which, along with a series of pink monochromes, began to augment his blue monochromes toward the end of his life. 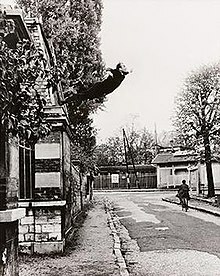 Klein is also well known for a photomontage, Saut dans le vide (Leap into the Void), originally published in the artist's book Dimanche, which apparently shows him jumping off a wall, arms outstretched, towards the pavement. Klein used the photograph as evidence of his ability to undertake unaided lunar travel. In fact, "Saut dans le vide", published as part of a broadside on the part of Klein (the "artist of space") denouncing NASA's own lunar expeditions as hubris and folly, was a photomontage in which the large tarpaulin Klein leaped onto was removed from the final image. Klein's work revolved around a Zen-influenced concept he came to describe as "le Vide" (the Void). Klein's Void is a nirvana-like state that is void of worldly influences; a neutral zone where one is inspired to pay attention to one's own sensibilities, and to "reality" as opposed to "representation". Klein presented his work in forms that were recognized as art—paintings, a book, a musical composition—but then would take away the expected content of that form (paintings without pictures, a book without words, a musical composition without in fact composition) leaving only a shell, as it were. In this way he tried to create for the audience his "Zones of Immaterial Pictorial Sensibility". Instead of representing objects in a subjective, artistic way, Klein wanted his subjects to be represented by their imprint: the image of their absence. Klein's work strongly refers to a theoretical/arthistorical context as well as to philosophy/metaphysics and with his work he aimed to combine these. He tried to make his audience experience a state where an idea could simultaneously be "felt" as well as "understood". As well as painting flat canvases, Klein produced a series of works throughout his career that blurred the edges between painting and sculpture. He appropriated plaster casts of famous sculptures, such as the Winged Victory of Samothrace and the Venus de Milo, by painting them International Klein Blue; he painted a globe, 3D reliefs of areas of France and dowels which he hung from the ceiling as rain. He also stuck sponges to canvases and painted dinner plates. Many of these works were later manufactured as editioned multiples after his death. In Blue Obelisk, a project that he had failed to realise in 1958, but that finally happened in 1983, he appropriated the Place de la Concorde by shining blue spotlights onto the central obelisk. At present, I am particularly excited by "bad taste." I have the deep feeling that there exists in the very essence of bad taste a power capable of creating those things situated far beyond what is traditionally termed "The Work of Art." I wish to play with human feeling, with its "morbidity" in a cold and ferocious manner. Only very recently I have become a sort of gravedigger of art (oddly enough, I am using the very terms of my enemies). Some of my latest works have been coffins and tombs. During the same time I succeeded in painting with fire, using particularly powerful and searing gas flames, some of them measuring three to four meters high. I use these to bathe the surface of the painting in such a way that it registered the spontaneous trace of fire. He moved on to exhibit at the Dwan Gallery, Los Angeles, and traveled extensively in the Western U.S., visiting Death Valley in the Mojave Desert. In 1962, he married Rotraut Uecker, sister of German artist Günther Uecker. He suffered a heart attack while watching the film Mondo cane (in which he is featured) at the Cannes Film Festival on 11 May 1962. Two more heart attacks followed, the second of which killed him on 6 June 1962. His son, Yves Amu Klein [fr], was born on 6 August in Nice. Yves Amu studied architecture, design, cybernetics theory of systems, and Fine Arts sculpture. He went on to create robotized sculptures. Rotraut Klein married the photographer and designer Daniel Moquay, and has homes in Paris; Phoenix, Arizona; and Sydney, Australia. Unaware of the importance of the Nouveau Réalisme movement until the 1990s, New York critics of Klein's time tried to classify him as neo-Dada, and other critics, such as Thomas McEvilley in an essay submitted to Artforum in 1982, classified Klein as an early, though enigmatic, postmodernist. A sort of parody of Klein's Anthropometry performance is featured in the film Wise Guys (original title: Les Godelureaux) directed by Claude Chabrol released in 1961. The Yves Klein archive is housed in Phoenix, Arizona, where his widow Rotraut Klein-Moquay has a home. Alongside works by Andy Warhol and Willem de Kooning, Klein's painting RE 46 (1960) was among the top-five sellers at Christie's Post-War and Contemporary Art sale in May 2006. His monochromatic blue sponge painting sold for $4,720,000. Previously, his painting RE I (1958) had sold for $6,716,000 at Christie's New York in November 2000. In 2008, MG 9 (1962), a monochromatic gold painting, sold for $21,000,000 at Christie's. FC1 (Fire Color 1) (1962), a nearly 10-foot long panel created with a blowtorch, water and two models, sold for $36.4 million at Christie's in 2012. In 2013, Klein’s Sculpture Éponge Bleue Sans Titre, SE 168, a 1959 sculpture made with natural sea sponges drenched in blue pigment fetched $22 million, the highest price paid for a sculpture by the artist. The estate of Yves Klein has been represented by Galerie Gmurzynska for the past three decades. ^ "Yves Klein". Biography. Retrieved 2019-03-21. ^ Hannah Weitemeier [de], Yves Klein, 1928–1962: Internacional Klein Blue, translated by Carmen Sánchez Rodríguez (Cologne, Lisbon, Paris: Taschen, 2001), 8. ISBN 3-8228-5842-0. ^ a b "Yves Klein (1928–1962)". Yves Klein Archives. Archived from the original on 30 May 2013. Retrieved 12 May 2013. ^ See also at YvesKleinArchives.org a 1998 sound excerpt of Monotone Silence Symphony Archived 8 December 2008 at the Wayback Machine (Flash plugin required), and Klein's "Chelsea Hotel Manifesto" Archived 17 September 2013 at the Wayback Machine (including a summary of the 2-part Symphony). ^ Thomas McEvilley. "Yves Klein: Conquistador of the Void". Yves Klein: A Retrospective. (Houston: Institute for the Arts, Rice University, 1982), p 25. ^ "Yves Klein (1928–1962) – Judo en familia". www.fgjudo.com. Retrieved 2019-01-13. ^ Tom Learner (2008). "Restoring the Immaterial: Study and Treatment of Yves Klein's Blue Monochrome (IKB42)". Modern Paint Uncovered. Los Angeles, CA: Getty Conservation Institute. ISBN 978-0-89236-906-5. ^ Quoted in Hannah Weitemeier, Yves Klein, 1928–1962: International Klein Blue, Original-Ausgabe (Cologne: Taschen, 1994), 19. ISBN 3-8228-8950-4. ^ "Exhibitions – Yves Klein : Proposte monocrome, epoca blu – Yves Klein". www.yvesklein.com. Retrieved 2019-03-21. ^ Held Jr., John. "The Formidable Blue Stamp of Yves Klein". Mailartist.com. Archived from the original on 2 November 2012. ^ Beale, Jason. "Yves Klein, The Void". Jasonbeale.com. Archived from the original on 19 July 2008. ^ Olivier Berggruen, "Yves Klein – The Void" in The Writing of Art (London: Pushkin Press, 2012), 80. ^ Stich, Sidra. Yves Klein. Hayward Gallery. London, 1994. ^ "An account and sound recording of the 1960 performance". Archived from the original on 21 February 2001. Retrieved 21 February 2001. CS1 maint: Unfit url (link). ^ "'+'". Web.tiscali.it. Retrieved 2012-07-06. ^ Yves Klein, Weitemeier, Taschen, 2004, p. 8. ^ Yves Klein Archives. "Chelsea Hotel Manifesto". 1961. Archived from the original on 15 January 2013. Retrieved 26 April 2013. ^ Kahn, Annette (2000). Yves Klein: Le maître du bleu. Paris: Éditions Stock. ISBN 2-234-05218-1. LCCN 00359365. OL 21884551M. ^ "Living Sculpture". Living Sculpture. Archived from the original on 10 March 2012. Retrieved 4 July 2012. ^ McEvilley, T. "Yves Klein: Messenger of the Age of Space." Artforum 20, no. 5. January 1982. pp. 38–51. ^ Tully, Judd (9 May 2006). "Warhols, Judds Drive $143M Sale at Christie's". Artinfo. Retrieved 23 April 2008. ^ Katya Kazakina and Philip Boroff (15 May 2013), "Barnett Newman Leads Sotheby’s NYC $294 Million Auction", Bloomberg. Wikimedia Commons has media related to Yves Klein.